Home BREAKING Breaking: Sen. Hontiveros and Pangilinan Nahuling Naka holding hands? Breaking: Sen. Hontiveros and Pangilinan Nahuling Naka holding hands? Netizen publicizes a picture of Senators Risa Hontiveros and Francis Pangilinan holding hands in public, seemingly affectionate, and lashed at the couple for their immorality. Eric Mabini posted on Facebook that if the picture of Hontiveros and Pangilinan showing affection was not fake, THEN, THESE INDIVIDUALS ON THE PICTURE ARE THE MOST BASTARDS-HYPOCRITE ENTITIES IN THE HISTORY OF PHILIPPINE POLITICS THESE DAYS. Mabini asserts that if they can show immorality in public, how much more in private. "YOUR DEEDS ARE AND WERE FAR MORE THAN EVIDENCES OF YOUR LUSTS, IMMORALITY, AND GREED ON MONEY, POWER, LIES AND EVILNESS!!!" Mabini expressed. Mabini further pointed out the likes of Senators Antonio Trillanes IV, Leila de Lima, Vice President Leni Robredo, and other "yellowtards" as deserving of hell for their corruption. "IF THIS PICTURE IS REAL, WAS NOT EDITED, NOT FICTITIOUS AND NOT A HOAX. THEN, THESE INDIVIDUALS ON THE PICTURE ARE THE MOST BASTARDS-HYPOCRITE ENTITIES IN THE HISTORY OF PHILIPPINE POLITICS THESE DAYS. THESE CORRUPT POLITICIANS PAID AND FINANCED BY DRUG LORDS AND OLIGARCH BUSINESSMEN ON THEIR POLITICAL CAMPAIGNS SAY THAT THEY ARE BEING MISJUDGED BY THE FILIPINO PEOPLE BECAUSE OF OUR FALSE ACCUSATIONS. BUT HEY YOU STUPID IDIOTS, IF YOU BOTH WERE ABLE TO SHOW THESE AFFECTIONS ON PUBLIC OF NO SHAME, I WONDER WHAT MORE CAN YOU DO IN PRIVATE. YOUR DEEDS ARE AND WERE FAR MORE THAN EVIDENCES OF YOUR LUSTS, IMMORALITY, AND GREED ON MONEY, POWER, LIES AND EVILNESS!!! I SWEAR TO GOD, UP TO THE LAST HEIRS OF MY BLOOD, I WILL TELL EVERYTHING OF YOUR EVILNESS, WICKEDNESS, IMMORALITY AND HYPOCRISY AGAINST THE FILIPINO NATION TO MY SONS AND DAUGHTERS. I SWEAR, THAT THEY WILL REMEMBER YOU AS THEIR ENEMY OF THE STATE FOR THE REST OF OUR LIVES. 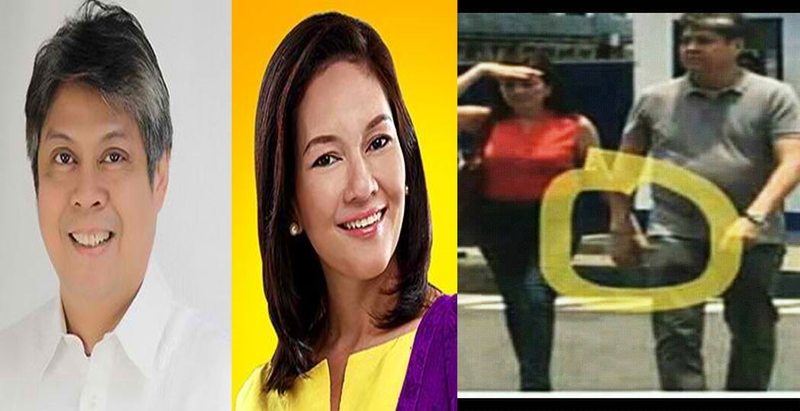 YOU (HONTIVEROS AND PANGILINAN), TOGETHER WITH YOUR FELLOW CORRUPT GOVERNMENT OFFICIALS AND POLITICIANS, LIKE TRILLIONES, SCANDAL QUEEN DELIMAW, LIAR, HYPOCRITE-FAKE VP ROB-REDO, THE REST OF THE YELLOWTARDS, THEIR LIAR PAID MEDIA- ABIAS-CBN, INQUIRER, CNN ETC. THIER OLIGARCH BUSINESSMEN AND DRUG LORDS FINANCIERS OF THEIR POLITICAL CAMPAIGNS, AND TO ALL THEIR SATANIC YELLOWTARDS SUPPORTERS, SATAN HAS ALREADY BEEN PREPARING PLACES FOR ALL OF YOU IN HELL. WE WILL ALL BE HAPPY SEEING YOU ALL OUT THERE BURNING ON FIRE WHILE WORMS PASS THROUGH YOUR EYES, NOSES AND EARS, SUFFERING OF EXTREME PAIN EVIDENT ON THE GNAWING OF YOUR TEETH!!! TO ALL MY FELLOW DUTERTE-MARCOS LOYALISTS AND KNIGHTS OF DUMARCS, DUTERTE-MARCOS REVOLUTIONAIRE FEDERAL MOVEMENT, KINDLY SHARE AND SPREAD SO THAT THE REST OF THE FILIPINOS AROUND THE WORLD WILL KNOW THAT THERE ARE THESE DIABOLIC ENTITIES EXISTING IN OUR PHILIPPINE POLITICS OF OUR GENERATION NOWADAYS..."